I had to fix a few slipped slates on the roof this morning, so I used the opportunity to take some snaps of the place and the view, from an unusual perspective. Anita bought 4 strawberry plants at random in a supermarket a few years ago. They made really nice strawberries; juicy and flavourful, and not small either. So I propagated them via the runners, and now we have a nice strawberry patch. The problem is... can you spot the strawberry plants in this picture? No, neither can I. Time for some serious weeding and reorganising. There are times when things go well and everything snaps properly into place, and there are other times when you just have to make the best of whatever life is throwing at you. 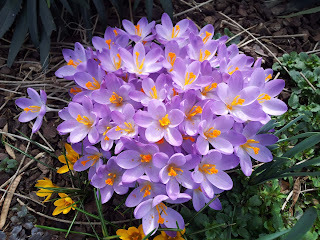 Last week's trip to England was a mixed bag. It started well enough with a birthday party for good friends; a fun evening, and an opportunity to catch up with other friends we'd not seen for ages. To make better value of the journey over, and since we had birthdays around the same time, we extended the stay to include the rest of the week in Weymouth. We rented a holiday cottage, a great little place to stay "Little Gem" . It's right near some pretty municipal gardens at Sandsfoot Castle, ten paces from the coastal path, and 5 minutes by car from the town centre. Great so far. Monday I got flu. At least, a high fever, sore eyes, aching joints, slow and wheezy breathing, you know the kind of thing. Given that it was over inside a week it probably wasn't flu, but then it wasn't a cold either. And after the mildest of Winters, the week we chose to stay coincided with the year's cold snap. With heavy snow and biting winds, it was a "natural disaster" just over the channel in Normandy; in Weymouth it was just cold and windy, with a flurry of snow. So on my birthday, I was dosed up with paracetamol and wrapped in hat, scarf and layers of clothing, and we fought our way into the teeth of a force 7 to see the sea at the end of Weymouth pier. As the weather softened and my state improved towards the end of the week, we visited local gardens (slowly), we watched the showers through tea-room windows, and photographed the budding Magnolias. I've had a fascination for steam trains ever since I was a kid, when my grandmother lived a few minutes from Swaythling railway station. I could climb over a gate into the allotments, then over the fence on the other side, and hide in the long grass by the tracks as the monsters thundered past. Or, I could go to the station and dare myself to stand on the footbridge, right where the train funnel passed underneath, covering me in steam and smuts. The steam railway at Corfe Castle and Swanage was therefore a must, and I was alert enough to enjoy it by the Saturday. My general impression that the food in England is better than that in France was reinforced by this visit; the Indian, Chinese, Seafood were all excellent, although generally more expensive than you would expect in France. And a pie-and-pint restaurant was a welcome discovery. Companies invest a lot in developing and protecting their brands. McDonald's is a familiar brand associated with hamburgers because of the effort that has been put into it. Some brands mean nothing outside of their context. McDonald's only means burgers because McDonald's made it so. The same is true for Orange, say or Amazon. Other brands carry some meaning: the words Kwik-Fit, for example, once you know that the brand is associated with certain types of car maintenance, implies that whatever you are having fitted will be fitted quickly; an important sales message for car owners who like using their cars to get around, and resent the time and hassles of repairs. In the end, the purpose of a brand is to sell. Mostly, but not always, it works by carrying the sales messages of its owner into the mind of the buyer, by association. You don't expect Michelin star quality food, nor luxury in a McDonald's. But you do know what to expect and if that's what you want, McDonald's will reliably deliver it to you. 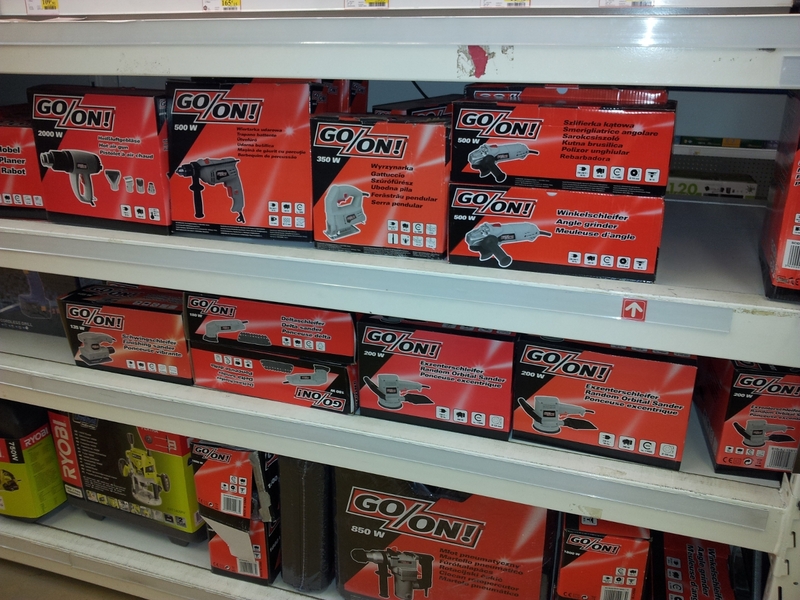 So I was quietly impressed by a range of power tools that hit the shelves of the DIY stores recently. I have bought a few such things myself over the years, and I have often noticed that I buy them somewhat on impulse. Do I really need that saw/drill/sander, etc? I have probably got something else that could do the job, even if it's not ideal. Perhaps I'll have to put a bit more effort in, or use more skill to get the desired result, but in any case, I probably don't have to buy anything. Top marks to whoever chose this brand name. 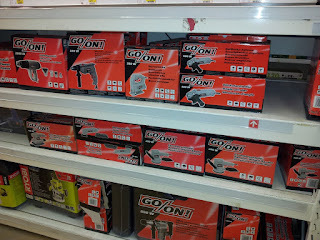 How can you resist a low-cost (I guess made in China but I don't know) range of power tools that sits there saying "Go On!" as you dither. Branding to achieve a decision in your favour at the point of sale. Cool. Does it work in France? Probably: they know a lot more English here than they like to admit.